The plant in Itasca, Illinois has over 100 employees and 65,000 square ft. Of manufacturing and distribution facilities. The company was certified to TS16949 by TUV in April of 2004. Concentric is the market leader in North America for diesel engine pumps and systems. Recent investments in state-of-the-art manufacturing facilities employ the latest technologies to ensure on-time deliveries of defect-free components. Local production is supplemented in some cases by products imported from the sister companies in the UK and India. Global sourcing of components and sometimes complete units has enabled the company to maintain an internationally competitive position, whilst maintaining full local support for logistics, commercial and technical services. The product range includes lubrication, cooling and fuel transfer pumps for industrial, and on and off-highway diesel engines ranging from 1.5 to 30 litres. In addition, Concentric provides engine front cover assemblies for agricultural and truck applications and lubrication charge pumps for compressor and transmission applications. The current customer base includes Carrier, Caterpillar, Cummins, CNH, John Deere, NMHG and Volvo-Mack. 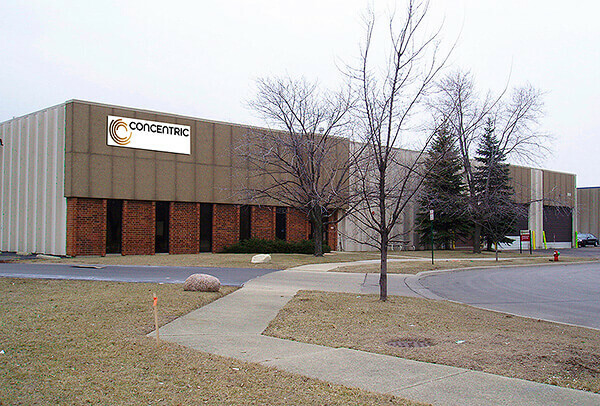 Concentric Itasca Inc. 800 Hollywood Avenue, Itasca, IL 60143-1353, USA.